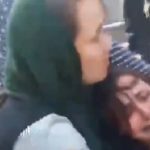 On Thursday, the Women’s Committee of the National Council of Resistance of Iran (NCRI) condemned the savage beating of a young woman who was accused of “improper veiling”. The MEK (PMOI) joins them in their condemnation of this human rights abuse by Rouhani’s regime repressive “Morality Police” (Gasht-e Ershad). The NCRI and MEK (PMOI) urge all organizations supporting women’s rights and human rights to stand with them in strong condemnation of this brutal attack by the regime’s suppressive forces. The beating took place in Tehran on Wednesday, April 18th. The Morality Police attacked the young woman, claiming that she was improperly veiled, and beat her into unconsciousness. The brutal attack occurred despite the protestations of the woman’s friends, who said that she had a heart condition. Mrs. Maryam Rajavi, President-elect of the National Council of Resistance of Iran, responded to the savage attack, saying that the brutal beating once again illustrated the ugly, inhuman and anti-Islamic face of the misogynous ruling regime in Iran. Insulting and brutalizing a young woman under the bogus pretext of improper veiling once again revealed the inhuman and anti-Islamic visage of the ruling mullahs of #Iran. I urge the courageous young people of #Iran to confront such disrespect and violation of Iranian women’s dignity and do not allow their sisters to be attacked by revolutionary guards and mercenaries. The violent enforcement of the strict women’s dress code, or hijab, in Iran is a means of controlling women and restricting the actions of Iranian society as a whole. Iranian women have fought against this oppression for 40 years and continue to do so, despite the brutality of the suppressive forces of the mullahs’ regime. Mrs. Rajavi called upon the youth of Iran to counter this violence and repression against women by the Revolutionary Guard and its mercenaries and to stand up for their sisters and not allow them to be insulted, abused, and suppressed.